Adam plans to propose to his girlfriend on the last day of their holiday, and Liv knows it's coming because her best friend, who is married to Adam's brother, spilled the beans before the start of the getaway. Their holiday is supposed to end on a blissfully romantic note, but a Google mapping fail leads them to disaster instead and they arrive back at the hotel grumpy with all the tension that has been bubbling underneath the surface for ages erupting into a big fight. The story of Adam and Liv is told in alternating perspectives in alternating chapters, which was a great way to see what was going on in both their minds the entire time and how so many good intentions ended up being complete failures. If only the duo had taken the time much earlier on in the book for a proper talk there probably wouldn't have been so much miscommunication and wrong assumptions (but it also wouldn't have been as much fun for the reader!). While the alternating chapters did occasionally trip me up while reading in short bursts on the commute (as I thought I was reading Adam's story, for example, when it was Liv's) I did think this was a great idea and worked especially well for this story. And of course the pages were filled with author Lindsey Kelk's telltale wittiness and hilarious turns of phrases, which meant that though I was reading about two completely new characters they still felt very familiar to me (not to mention that I may have giggle-snorted my way through some, okay most, of the chapters). We Were on a Break isn't the story of Ross and Rachel but it could totally be the contemporary British equivalent (though even funnier). And in between the mountains of eye-rolling miscommunications and slapstick sequences, there is also a relatable story about the many hurdles of dating in the 21st century. Hilarious, yes, but also a genuinely great insight into the ups and downs of relationships. 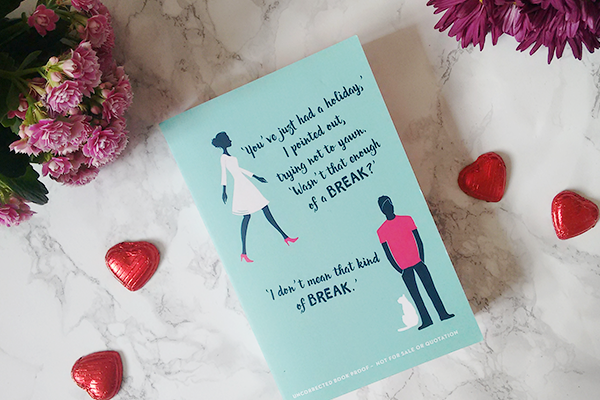 We Were on a Break is published by HarperCollins and you can buy your copy from Foyles or your own preferred retailer. This review is part of the We Were on a Break blog tour, make sure you check out the other stops too for more great content around this book!